155 Beacon is located on the south side of Beacon, between Berkeley and Clarendon, with 153 Beacon to the east and 157 Beacon to the west. 155 Beacon was built ca. 1861, one of six contiguous houses (149-151-153-155-157-159 Beacon) built at the same time in a symmetrical pattern. The two houses on each end (149-151 Beacon and 157-159 Beacon) feature arched, extended entries and dormers with peaked roofs, and the two houses in the center (153-155 Beacon) have entries flush with the façade and originally had dormers with arched roofs (the dormer on 153 Beacon was remodeled sometime after 1942 to have a peaked roof matching the dormer on 151 Beacon). Click here for an index to the deeds for 155 Beacon. 155 Beacon was purchased on July 5, 1860, by shipping merchant Sewall Tappan. He and his wife, Elizabeth Sawyer (Rollins) Tappan, made it their home. They previously had lived at 38 Chestnut. Sewall Tappan died in November of 1879. Elizabeth Tappan continued to live at 155 Beacon. During the the 1880-1881 winter season, she was joined by her son-in-law and daughter, Francis Henry Appleton and Fanny Rollins (Tappan) Appleton. They previously had lived at 167 Beacon and were in the process of building a new home at 265 Commonwealth. They and Mrs. Tappan moved there by the 1881-1882 season. On February 7, 1881, 155 Beacon was purchased from Sewall Tappan’s estate by Charles Wolff, the Austrian Consul. He previously had lived at 3 Chestnut. During the 1885-1886 winter season, Charles Wolff was living elsewhere and 155 Beacon was the home of Sewall Henry Fessenden and his wife, Louisa Green (Bursley) Fessenden. They previously had lived at 4 Marlborough. He was agent for the Boston and Sandwich Glass Company. By the 1886-1887 season, the Fessendens had moved to 17 Hereford and Charles Wolff was living at 155 Beacon once again. He continued to live there until about 1888. On April 24, 1888, 155 Beacon was purchased from Charles Wolff by Otis Everett Weld, a wholesale grocer and wine merchant He was unmarried. He previously had lived at the LaGange Hotel. Otis Weld’s brother-in-law and sister, Edward Cyrenius Richardson and Catharine Elizabeth (Weld) Richardson, lived with him. Edward Richardson was a steamship agent. They previously had lived in Savannah, Georgia. On January 7, 1892, Catharine Richardson acquired 155 Beacon from Otis Weld. Otis Weld died in March of 1897. The Richardsons continued to live at 155 Beacon until 1899, but had moved to 9 Bay State Road by 1900. On August 1, 1899, 155 Beacon was purchased from Catharine Richardson by Lucy Catherine (Daniell) Crehore, the widow of George Clarendon Crehore. Their two youngest children, Charles Lemuel Crehore and Lucy Clarendon Crehore, lived with her. They previously had lived at 209 Beacon. Charles Crehore was a banker and then treasurer of a sugar manufacturing company. Lucy Crehore died in May of 1915. Charles Crehore and Lucy Crehore moved soon thereafter to Hyde Park. Catherine Crehore’s estate continued to own 155 Beacon. During the 1915-1916 winter season, 155 Beacon was the home of William Codman Sturgis and his wife, Carolyn (Hall) Sturgis. They previously had lived in Cambridge, and before that in Colorado Springs, where he was Dean of the School of Forestry. By the 1916-1917 season, they had moved to 61 Mt. Vernon, and soon thereafter to New York City, where he became educational secretary of the Board of Missions of the Episcopal Church. The Sturgises’ son, Alanson Hall Sturgis, lived with them. He was a draftsman in the architectural offices of his uncle, R. Clipston Sturgis, who lived next door at 153 Beacon. After William and Carolyn Sturgis moved to New York City, Alanson Sturgis lived at 153 Beacon with R. Clipston Sturgis and his wife, Esther Mary (Ogden) Sturgis. 155 Beacon was not listed in the 1917-1920 Blue Books. On May 27, 1920, 155 Beacon was acquired from Catherine Crehore’s estate by Miss Edith L. Gallison of Newton. She was a stenographer in a real estate office and probably was acting for her employer, possibly real estate dealer Gordon B. Poole, who acquired the property from her on June 3, 1920. On October 25, 1920, 155 Beacon was acquired from Gordon Poole by William Francis Warden. He and his wife, Eleanor Cotton (Denham) Warren, made it their home. They previously had lived at 257 Marlborough. William Warden was an artist and, prior to the outbreak of World War I, they had lived in Paris for a number of years. William Warden died in March of 1922. Eleanor Warden continued to live at 155 Beacon until about 1929 and also maintained a home in Indian Rock, Maine. The house was not listed in the 1930 Blue Book and was shown as vacant in the 1930 City Directory. On July 5, 1930, 155 Beacon was purchased from the William Warden’s estate by Rt. Rev. Henry Knox Sherrill. He and his wife, Barbara (Harris) Sherrill, made it their home. They previously had lived at the Trinity Church Rectory at 233 Clarendon. Henry Knox Sherrill was Rector of Trinity Church until October of 1930, when he was consecrated the ninth Bishop of Massachusetts. He remained in that position until 1947, and then served as the Presiding Bishop of the Episcopal Church until 1958. The Sherrills continued to live at 155 Beacon until about 1944, but had moved to 41 Commonwealth by 1945. 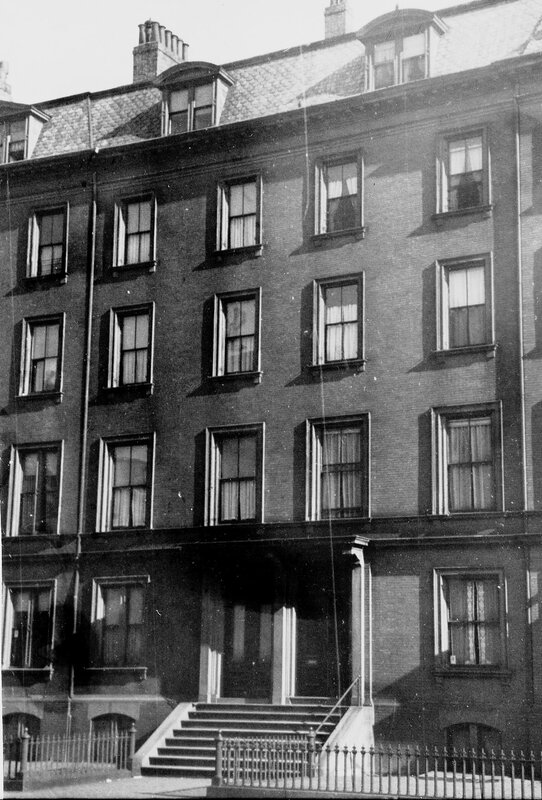 On August 29, 1944, 155 Beacon was acquired from Henry Knox Sherrill by Shirley Clifford Speed, a real estate dealer who converted many Back Bay houses into lodging houses and apartments. On September 21, 1944, 155 Beacon was acquired from S. Clifford Speed by Jane T. (Sheean) Sullivan Goodwin, the widow of John F. Sullivan and of William James Goodwin,. 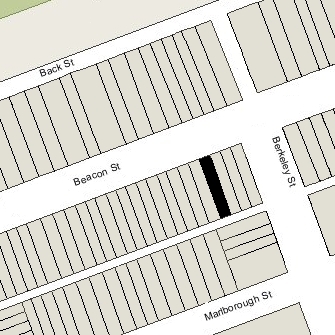 She previously had lived and operated a lodging house at 116 Marlborough. She continued to live at 155 Beacon and operate it as a lodging house for the next thirty-five years. On April 24, 1979, 155 Beacon was purchased from Jane Goodwin by the 155 Beacon Associates, Inc. (Robert Epstein, president; David Epstein, treasurer). In April of 1979, David and Robert Epstein applied for (and subsequently received) permission to remodel the property into five residential units. 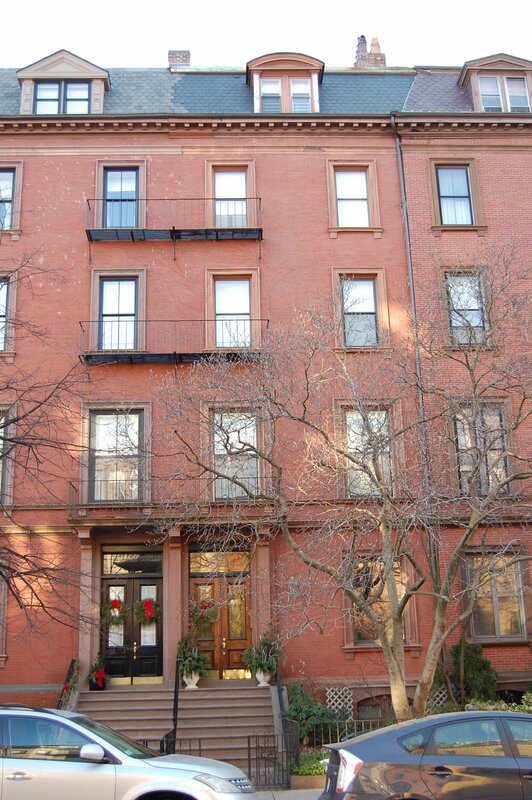 On October 11, 1979, they converted it into five condominium units, the 155 Beacon Street Condominium.